It's time to add these DIYs to your list. The fact that we love IKEA shouldn’t come as a surprise to anyone. The Swedish retailer’s knack for providing us with a never-ending arsenal of sleek furnishings—at affordable price points, no less—is certainly something worth celebrating. The DIY-friendly nature of said products is only an added bonus. From the clever ways each IKEA find can be used to the unexpected pieces available, there is always something new to discover in store. And as chic as each of these pieces may be, the thought of extending a personalized detail to the otherwise pared-down nature of each product can be a particularly appealing one. From headboards and nightstands to outdoor furniture and contemporary dressers begging for a fresh coat of paint, IKEA’s product offering has been the object of many a renovations and hacks. Ahead, we look to the retailer’s classic staples and the creative reinventions that have ensued. Take a look. This handmade lamp exudes effortless simplicity and is versatile enough to live within a wide variety of styles and spaces. Its neutral build makes it the ideal product for a colorful revamp. Beads, decals, and a mini basket transform the ordinary light into a whimsical accent piece. Paired with the mini stuffed animals, this DIY is the ideal (functional!) adornment for the little one’s room. Get the how-to on Husligheter. A mobile side table is the small-space’s best friend. Its ability to easily transfer from room to room is reason enough to make the investment but the fact that it can function as an efficient storage solution for just about any one of your needs really just seals the deal. Crafted from solid beech wood and paired with an acrylic lacquer top, its understated design is yet another major plus. 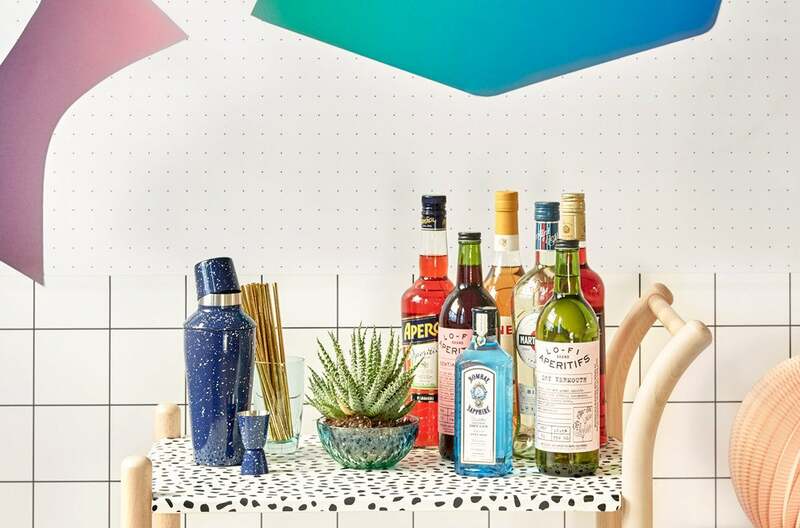 Here’s the stylish bar cart you never knew you needed. From the delicate birch wood details to the ultra chic wallpapered surface, it’s the ideal accent piece that will fit in with just about any decor scheme. The versatile cart can be used a multitude of ways—a library on wheels, coffee cart, side table—and the choice of the wallpaper print is completely up to you. The U.S.’s version of the classic Metod cabinet system (which is, unfortunately, only available in Europe and Asia), the Sektion series boasts an array of cabinets and bases, perfect for the ultimate customizable kitchen. And while there are only a handful of ways one can really “hack” a cabinet, the latest outpour of companies whose sole focus lies within said task, are here to change things up. You give us Ikea’s Metod cabinet system and we (er, Reform) give you a front replacement that will instantly transform it into an ultra luxe and statement-worthy storage unit. The Copenhagen-based studio prides itself on creating a collection of pieces that will help elevate the standard line of cabinets available at Ikea. Seeing the growing need and interest in custom-made carpentry kitchens, Reform’s goal is all about making that dream more of an affordable reality. We love this front for its sleek and streamlined build, and the subtle textural detail the composition of the front provides. Minimal DIY required. Ikea’s Lack series is undeniably one of its most popular to date. The versatility behind the structure of pieces is the primary reason, but the fact that it can seamlessly fit within a wide array of decorative styles is an added bonus. We’re doling out major creativity points for this one. What was once a standard lack shelf is reinvented into the ultimate reading nook, complete with a cushioned lounge, ample storage, and plenty of style to go around. Get the how-to on Atelier de Curiosite. The Billy bookcase is about as iconic as it gets, and thus, the opportunities for a revamp, essentially limitless. While the series is comprised of a variety of diverse shelving units, each embodies the clean-cut and streamlined build the line is well-known for. Even more impressive? The fact that it is estimated that every five seconds, one billy bookcase is sold somewhere in the world. Can you spot the hack? This clever blogger transformed his into a stunning built-in unit, washed in a timeless shade of gray, which ingeniously blends in with the surrounding decor. Get the how-to on designsixtynine. Available in a variety of sleek finishes, the Lack wall shelf is yet another classic. With the ability to emulate the feel of a floating shelf, this streamlined piece can double as everything from a bookshelf to so much more. Pair Ikea’s classic Lack shelf with a leg frame to create a desk or entryway console. We’re taking cues from this scene that subs the alternate side of the frame with a stack of color-coded books instead. Get the complete how-to on Livet Hemma. Whether this one is utilized as per its intended purpose as an anti-mosquito repellent or as a canopy in the little one’s room, its delicate finish is all about instilling the space it occupies with a soothing element. A woodland-inspired dinner party calls for plenty of ethereal textures that will offset the rigidity of the surround. Here, the Solig nets are revamped to function as dreamy accent pieces above the dining tables. Get the DIY on Ikea. Ikea’s Sinnerlig pendant lamp has been making a serious statement this season, and we’re all for reimagining the many ways this one piece can be used. We’ve seen it everywhere—from restaurants to homes, and everything else in between—but a revamp of the item? Not so much. The popular bamboo fixture is reimagined as a stylish accent piece, and one which certainly doesn’t compromise on functionality. Here, it comes paired with a set of blush-toned legs that transform the piece into a low-sitting floor lamp. You see a muffin tin, we see the opportunity for so much more. Although, we will say that this durable piece can definitely function per its intended purpose all the same. Who knew a muffin tin could double as table decor? Fill each well of the tin with a cluster of herbs to create an edible centerpiece that’s both fragrant and chic. Consider rattan the It material of the season and what better way to embrace the trend than by way of a cozy seat? This new classic will impart your space with quite the stylish accent. With the help of a little jersey cotton and yarn, this seat is transformed into a playfully colorful accent piece. Color-code the design to your heart’s content or embrace a single hue for a beautifully monochromatic or high-contrast finish. Get the how-to on Brit + Co. The simplicity of the Ivar’s design is a major reason as to why this iconic piece has its mark down as a classic. The fine pine finish and streamlined build a few others on the long list. Customization is not only simple but, highly encouraged. You see an Ikea dresser, we see a stylish focal point that’s all about using that blank wall space. There’s your typical storage, and then there’s this. Stack two sets of a pair of Ivar cabinets side by side, and paint a mural of your choosing or cover with a graphic wallpaper for a true statement worthy finish. What may seem like simply an added accessories for a bigger furnishing staple, there is actually a whole lot more to this slatted bed base than meets the eye. Spoiler alert: Its repurposed use is one you would be hard-pressed to imagine. Here, the slatted bed base becomes a wall-mounted storage solution for the home office—bonus points for being both stylish and functional. Get the how-to on Ich Designer. While we can’t deny the allure of the rich shade of terra cotta that provides this staple with its depth, we’re all for a little revamp that brings on a mod and Scandinavian-inspired touch. Terracotta planters are a thing of the past. Reinvent Ikea’s Ingefara planter with a fresh coat of paint and impart the essential with a contemporary touch that can’t be matched. Featuring a high-gloss white and bamboo finish, this vanity exudes effortless elegance to no restraint. And much like the other pieces found in Ikea’s extended line of cabinets and bathroom or kitchen basics, the opportunities for customization come with few restraints. Meet Superfront, a Swedish company that offers a variety of stylish accessories with the purpose of elevating Ikea basics. It’s hard to believe that this was once just a plain sink cabinet. Couple the cabinet front with an equally lustrous fixture and you will have a vanity that exudes effortless elegance to the nth degree. Yet another Ikea staple which has seen its fair share of hacks and customizations. This versatile piece boasts an understated structure that will allow it to live within a wide range of decorative uses. Lend a touch of color to your gallery wall with a colorful detail that really goes the distance. Here, the painted matting of the frames brings an unexpected yet entirely pleasant pop of color to the finish of the wall art. Get the how-to on The Sweetest Digs. You know it, we know it, this gardening basic could definitely benefit from a little TLC. Preferably, one that comes with a vibrant color detail and added oomph. An everyday planter is reinvented with an edgy texture that exudes fearless style with a bright pop of color. Because one can only have so many matte or glossy planters in their plant corner. Right? Get the how-to on Poppytalk. There is so much more to these coffee table essentials than one would come to imagine. And given their very low price point, it is safe to say that a little revamp and DIY is in order. Paint transforms these basic coasters into chic and minimal trinket dishes. Now, whether you choose to use utilize them as mini catch-alls for your daintier pieces of jewelry or clad them with a vibrant splash of paint and keep them as is (as coasters), is completely up to you. Get the how-to on DIYs. If we were being honest, we would admit it, this lighting basic definitely errs on the snoozy side of things. And while one may be pressed to pair it with a standard table lamp, the creatives over on Designlovefest had a slightly different idea. For the overhead lighting that looks a bit outdated or plain, add a delicate yarn accent for a more dressed up feel. We are loving the high-contrast detailing of this DIY, where a subtle black trim helps contribute depth and an element of interest to the otherwise whitewashed piece. Get the scoop on DesignLoveFest. Pro tip: Raid Ikea’s bedding aisles the next time you find yourself in need of a new throw pillow or textural element. This perfectly sized cushion is one that comes with plenty of potential for a little DIY. Enter one budget-friendly DIY that takes under an hour to make and only requires a cushion plus a cover. Outfit an empty nook with a slew of these ultra-fluffy and beautifully sinkable floor poufs, to create the ultimate relaxation nook in your space. Get the scoop on Poppytalk. This article was originally published March 4, 2016. It has been updated with new information.